Do you think you might have some bad eating habits that need to be changed? If so, then you’re not alone! There are many, many unhealthy eating habits that too many people are stuck in. They might not realise that they have these habits or they may not know how to break them. 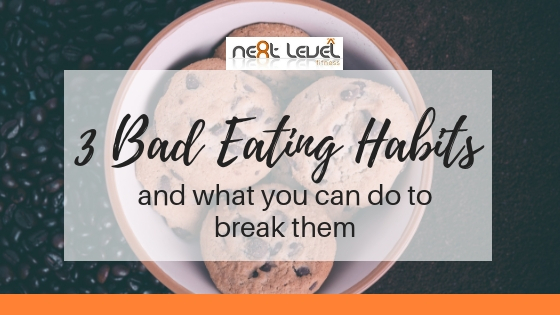 In this post, we’re taking a look at three of the most common bad eating habits, and what you can do to break them. Snacking can be healthy or unhealthy, and it’s a very fine line between the two! However, it’s easy to fall into the habit of snacking throughout the day (and night) on sugary foods that only provide empty calories. And alongside these empty calories you can expect a quick boost of energy that is soon followed by a sugar crash (and more snacking!). If you’re not getting enough protein or healthy fats in your main meals then it’s not long before those hunger cravings return. Eating healthy meals that are packed with protein will help to keep you fuller for longer. This will stop you going overboard on the snacking. But if you do find yourself getting a bit hungry then there’s plenty of healthy options you can go for. Too many people are opting for crisps, biscuits and other sweet things. What you should be having are things like hummus, almonds, peanut butter, fruit and veggies. When your mind is elsewhere you’re more likely to consume more food than you actually need. So if you’re in the habit of watching TV or playing around on your phone when you eat then you might not be aware of when you’re actually full. This could lead you to eat more than you really need. Another way that you might be mindlessly eating is by eating straight from the packet. You might have planned to only have a square or two of chocolate but you end up eating the whole bar. Or maybe you thought you’d stick to that one handful of popcorn but before you know it the bag is empty. The thing is, when you’re distracted but have food close to hand then you’re likely to keep eating. Instead you should be watching what you eat and getting your portions ready so that you’re not eating several servings. It’s so easy to make bad decisions when it comes to our eating habits. You pick up convenience foods and fast food instead of making your own healthy meals. And this isn’t something that happens now and then, it’s happening every day. It’s also easy to make the right decisions as well. You can get started by clearing out all the sugary, unhealthy foods from your cupboards, getting on top of your meal prep (http://www.nextlevelfitness.im/5-tips-to-make-meal-prep-a-breeze/), and only buy the right foods when you do the weekly grocery shopping. Not surprisingly, many bad food choices are made when we socialise. We choose all three courses AND a glass of wine. We go for the most unhealthy choices on the menu. We go overboard with the pints. Most restaurants and cafes will have healthy options – you just need to be mindful of what you’re ordering and not be afraid to ask questions. So, with all this in mind, what can you start doing today to break your unhealthy habits?